Looking for a cost effective (but effective) men's grooming solution? Then this men's grooming product might just be perfect for you. Well, before we get into the product details, let's look at all the items we get bundled with this grooming set. Now, first of all, this product is almost halfway in price as compared to its other counterparts. So you might want to keep this in mind while making the final decision. Secondly, one of its biggest features marketed is a cordless use. Although it is impressive for this price range, the product provides you with a runtime of 60 minutes on a 12-hour charge. Well, that's a lot of time consumption. Also, this model, unlike its expensive brothers, doesn't even have a quick charge feature. Next up, the blades are made of high-carbon precision ground blades which ensure that the blades remain sharp for a long time. The sharp blades along with variable combs add more versatility to your beard styles. Multi-position guide comb helps you easily set the required length setting ranging from 1.5mm - 13mm. Also, 0.5mm is as close as you can get. Lastly, you can use the cleaning brush to clean the kit although cleaning it isn’t the easiest task out there. Talking about the kit, the kit is decent but isn’t able to accommodate all the items as efficiently as the company promises. Now, as we have talked a lot about the product, let’s summarize its pros and cons. Great for shaving off a beard and doing exacting lines and detail work. Support for cordless use for on the go usage. Long-lasting precision-carbon ground blades for sharp and detailed trimming. Attachment Combs with length setting from 1.5mm to 13mm with 0.5mm as the closest possible trim for loads of grooming styles to try. Multi-position guide comb for easy and fast length adjustment. 60 minutes of cordless use after a full charge. Ergonomic design for increased comfort while trimming. Very low price as compared to other similar products out there. Very long charging time of 12 hours. However if you have the corded option this won't be an issue. No quick charge support for an emergency trim. Not the easiest product to get the attachments on. The kit doesn’t exactly solve every purpose. Well, we have elaborately about the product but the conclusion is that with a bit of planning and time-management related to your grooming, this could be a top notch economic men’s grooming product. 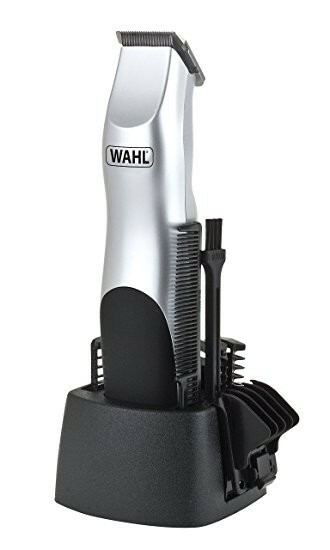 What is great about this shaver is the cord or cordless option. Consider that you get to your more expensive shaver that needs a charge, you have to wait and charge it. With this at least you can plug the charger in and get your shave! Check out the videos we linked to to to se if this fits your unique need. We found it tough to find any shaver that did everything well. This at least won't cost you much at all and it does do the job it says though with niggles such as the tray being fiddly. If you're on a budget we recommend this one.